Dunno what to cook today? Why not try this one..yummy! Heavy soup indeed but easy to cook. I call this Feuilletée soup and others call this Zupa soup which as far as I know was just mushroom soup without pastry. 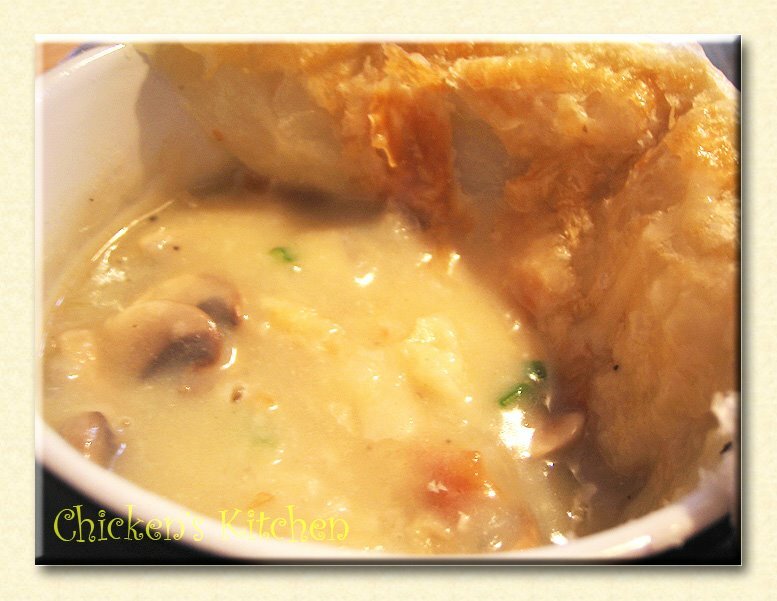 Zupa soup or Grzybowa is a Polish mushroom soup. Melted butter in a pan along with oil, add onion leave till golden brown. Add diced chicken, when the chicken color already pale add mushroom and flour stir till dissolve. Pour water bring to boil, add pepper and salt leave to cool. Prepare2 bowl and put soup into it. Roll out the pastry and cut 5 cm wider than the soup bowl, place it on top brush with egg yolk. 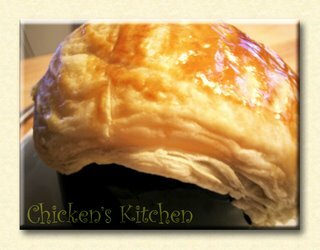 Pop up into the oven for about 30 minutes.